Each morning during the winter in -30 C temperatures, a hockey team soaks a frozen lake in water in preparation for a long day of practice. Though not unheard of for a player from a cold climate, no one wouldn’t would pick India to be a setting for ice hockey, yet that’s the situation with the Ladakh Women Ice Hockey Federation. Less than a year ago, this team was unknown, but a viral video helped change their fortune and spur support. Now, Hayley Wickenheiser, the Canadian Tire Wickenheiser World Female Hockey Festival (Wickfest), and Girls Hockey Calgary are working together to bring the girls over the pond to play in Wickfest 2018 next fall. The team plays in Ladakh, located in northern India around 11,000 feet up amongst the Himalayas. Last February, a video produced by Sports Possible spread around the hockey community. Andrea Elliott of Calgary has a daughter playing elite hockey in the city. She discovered the team in India in the video and wanted to help them. Elliott shared it with Bindy Dulay, a supporter of girls hockey and the Calgary Fire. Despite being a province over, Dulay decided to support the Calgary Fire. “Bindy and I made a connection last year during Firestarter, trying to raise awareness for girls hockey and she jumped on board despite not having any daughters on the team,” Elliott said. Elliott shared the video with Dulay. She and Elliott reached out to their networks. 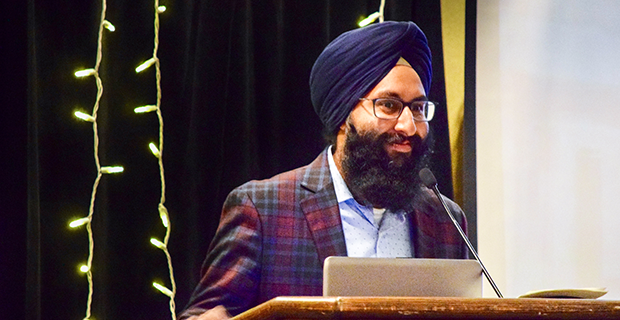 Elliott contacted Wickenheiser, and Dulay brought in Hockey Night in Punjabi’s Harnarayan Singh. India2YYC was born. Elliott helps run some of the local fundraisers, while Dulay is involved in every facet, from fundraising to travel plans for the girls. The invite was for this year, but the team said they weren’t quite ready and needed some more training to compete. To help the team, some of Wickenheiser’s training staff could head to India this winter to work with coaches and players. Of course, a lot of the plans depend of money for this large venture. The goal is $200,000. That would cover costs to send staff this winter and bring some players from India to Calgary more than once, among other things. India2YYC is looking for an airline sponsor to help subsidize costs, plus donations and event support. They already have a Calgary hotel ready to host the team, plus Canadian Tire has stepped up to equip the team, according to Dulay. On Sept. 14, Wickfest, GHC and the Calgary Fire hosted G.L.O.W. Night, the first fundraising initiative. Standing for 'Girls Light Our World,' the Diwali-themed evening was part of Firestarter a fundraiser for Calgary Fire teams. Along with Elliott, Kimberley Perry is the co-coordinator of the G.L.O.W. evening. Perry said they’d like to send Calgary Fire players to India to play with the team, plus potentially bring a few members of the Indian team over before Wickfest. Before G.L.O.W. Night, Perry said she was excited to share the buzz surrounding the initiative with the Indian team. “We were going to have a lot of the stuff coming from tonight to be able to share with them so they can realize the buzz that’s happening here and everything that we’re excited to be a part of to help them. I don’t think they realize their story is capturing a lot of people, including some that aren’t in hockey,” Perry said. The WHL’s Calgary Hitmen have also committed to helping with the India2YYC initiative. The team will be donating $5 of every $15 ticket sold at "Women's Night at the Saddledome" on Oct. 22, plus a Diwali-themed intermission is being organized. After the video spread, the story was picked up by The Logical Indian, an Indian news website. They started a campaign to support the team in training, get gear and grow as a team. More than 3,000 supporters helped raise $49,000 in an online campaign. It was game-changing, to say the least. As a result, the team had the chance to train in Kyrgyzstan in an arena for the first time. 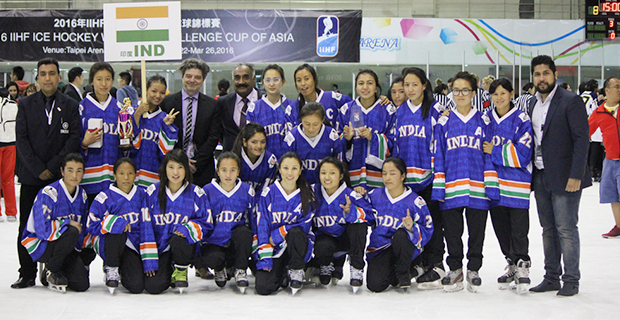 Then, last spring at the 2017 IIHF Challenge Cup of Asia, India recorded their first-ever tournament wins over the Philippines, then Malaysia, to finish fourth. To be eligible for government funding, at least 75 percent of states must play the sport. That simply isn’t possible at the moment in India, with one rink and only part of the country having frozen lakes. The girls still have to prepare their own ice on the lake, and equipment is also hard to come by. India2YYC will be more than just an experience for the team and the support from this will likely push the team to new heights. From equipment and skills, awareness around the team will increase. Dulay said she is excited about the community coming together. This is still more than a year out, but the excitement is clear. Perry echoed Dulay’s statements.